Mentoring relationship = A Meeting. Period. Management team and Learning and Development applaud a positive mentoring culture because of the mentoring meetings that are occurring. This isn’t every mentoring relationship but it sure describes many of them. I’ve named it ‘Yakking, Tracking, Get Sent Packing” and no organization wants or needs that. Too many individuals have their bottoms nailed to their chairs for a meeting. Real change isn’t happening. Meetings are! Employees are feeling frustrated with their mentoring experiences and too many organizations see very little strategic ROI for their costly efforts. The fix to this problem took root in two of my early lifetime experiences. Dad and Grandpa also took many young cowboys with them as they traveled those dusty roads. The key word iswith them. They took the men with them to round up cattle and strike a deal. They believed that if those young men didn’t “look the critter in the face” and “get their boots dirty” too, they weren’t really learning the business.They rarely worked alone. You learned by going WITH them. That’s the first root that was planted – I learned that the best mentoring doesn’t happen by sitting at a conference table under the florescent lights at a pre-appointed time. It happens when you take someone with you into real life. 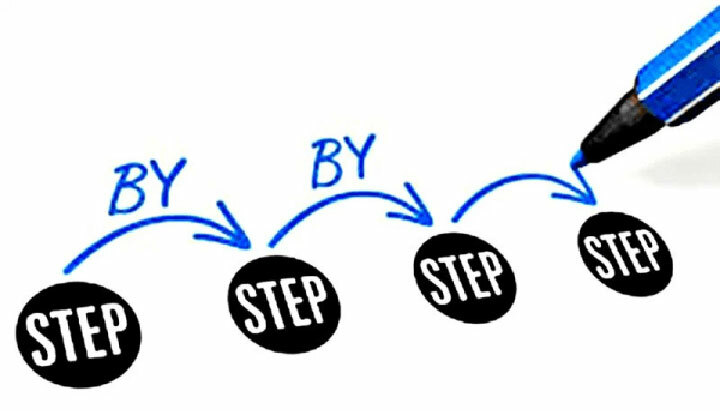 The second part of the solution came through knowing the value of a process, of “steps,” if you will. When I was eight years old, I baked my first cake. My mom gave me a recipe with simple steps to follow. head for my destination by staying more or less on the right side of the road. When I took a short try at country-western dancing, I memorized every kick and twist performed by the cute cowboy instructor who taught the line dances; I wouldn’t be caught dead tromping on my dance partner’s boots because I didn’t know the steps! DON’T RELY JUST ON A MONTHLY MEETING AT THE OFFICE TABLE. GO WITH YOUR MENTOR OR MENTEE. FOLLOW SOME THOUGHTFUL, PRACTICAL STEPS THROUGH A GAME-CHANGING PROCESS. Terrific book! The practical four-step process combined with inspiration and humor makes this book a must-read for anyone wanting to thrive in a mentoring relationship. This book really made me think outside the box with regards to transferring skills and equipping others for success. I recommend it! 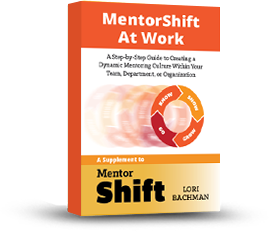 If you follow Lori Bachman’s advice on how to transfer work and life skills, wisdom and knowledge through her four-step MentorShift process, you will realize a profound and lasting way to make a difference. Knowledge and experience transfer is a vital part of all emerging and established business organizations. MentorShift provides a refreshing perspective on how effective mentoring relationships can have a lasting impact for all involved. Lori Bachman is a dynamite mentor! She understands what it takes to teach individuals and teams how to build their knowledge base and transfer skills in a way that makes them want to jump right in. Mentoring is about education. This book does a fantastic job of getting its readers to ask, ‘What do I know that I can teach others and what do others know that I might learn from them?’ With Lori’s four-step process, the learning baton is passed with finesse. Lori Bachman is a true thought leader in the world of mutually beneficial mentoring. Her groundbreaking book, MentorShift, outlines a revolutionary shift for companies ready to build a mentoring culture that improves their bottom line and creates lasting cultural change. I intend to recommend it to every executive I know! There’s not one good word to describe MentorShift – there are many. Straightforward. Conversational. Feeling. Funny. Real. Participatory. Lasting. Finally, there is a book about mentoring that actually shows an understanding of the journey and provides the means to take it – no matter who you are, where you are, or what role you’re playing. 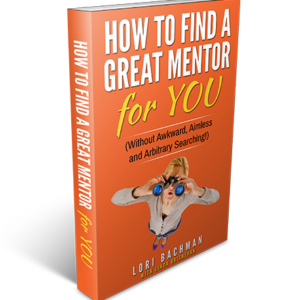 Lori Bachman is an author who has wisely discerned that mentoring isn’t about mentor or mentee, but about both. Always. That keen insight allows this book to deliver on all those ‘good words’ to anyone who reads MentorShift and begins the rewarding journey that is mentoring. Finally! A business book with actionable insights that’s full of heart. It gives readers rock-solid specifics that are worth their valuable time, mind and dime. Read it and reap. Mentoring is one of the primary methods for inter-generational transfer of vital information. It’s been around since the dawn of human tribal societies. 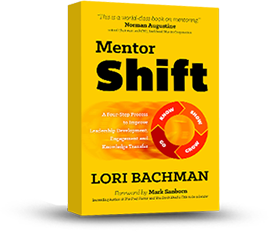 Lori Bachman’s invaluable MentorShift book provides more than ample motivation for becoming a mentor, together with a wealth of suggestions for how to be one with maximum value for both mentor and mentee. It really is a completely comprehensive compilation that enlightens a much discussed but little understood critical aspect of human experience. Do you want your employees engaged and proactive about sharing knowledge? Buy this book. It will equip your association or agency leaders, managers and employees alike with specific, innovative ways to do just that. MentorShift combines a real-life, hands-on process that any leader or medical professional can immediately put to use. The medical community would be greatly served by embracing this book on mentoring.